Britain's Prince Harry is collaborating with Oprah Winfrey on a new television series tackling the issue of mental health, CNN reveals. It aims to inspire viewers to have an "honest conversation about the challenges each of us faces," according to a statement from Kensington Palace. The statement added that the project will attempt to equip people "with the tools to not simply survive, but to thrive." Harry said he was "incredibly proud" to be working alongside Oprah on the "vital" series. 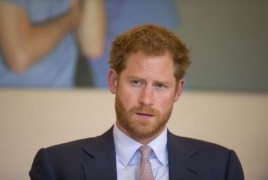 "I truly believe that good mental health -- mental fitness -- is the key to powerful leadership, productive communities and a purpose-driven self," Harry said. "Our hope is that this series will be positive, enlightening and inclusive -- sharing global stories of unparalleled human spirit fighting back from the darkest places, and the opportunity for us to understand ourselves and those around us better." Winfrey, who attended Harry's wedding to Meghan Markle -- now the Duchess of Sussex -- in May, told "CBS This Morning" Wednesday that the collaboration began when she was having a conversation with the prince and asked him what the most important issues facing the world were.